So far in this class we have studied how things move and how their motions change. Now we are going to discuss more of why objects’ motions change. To do this, we need to know about energy. Matter is easier to discuss because you can see most of it. You can measure its mass, its volume, its velocity. Energy is more abstract. Since it is not a material substance, it can’t be measured directly. Matter is what gets moved. Energy is what causes the matter to move. It is very difficult to define what energy actually is. The classical definition of energy is the ability to do work. If an object is capable of doing work, it has energy. What is work? When a force is applied to an object to make it move, work is done. These definitions are confusing because they each use the other. Every moment in your life deals with energy transformations. You eat to have the energy to run, think, and work all day. If you think it all the way through, the energy you used today to walk between classes actually came from the sun. You could walk because that energy came from your cereal this morning. Your cereal was once corn. The corn plant got its energy from the sun. 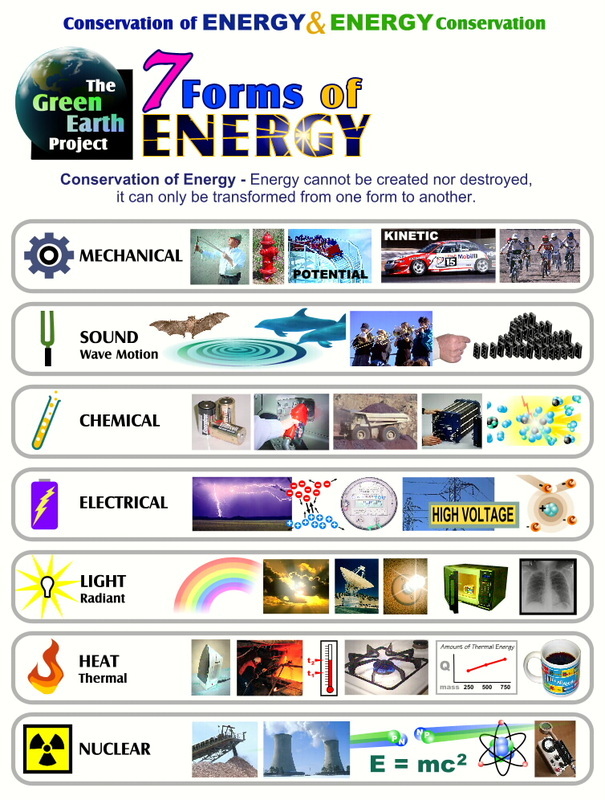 We will define energy as the result of work being done on an object. If work is done to an object, that object is gaining or transforming energy. There are many different types of energy, but they fall into two general categories - Potential (stored) and Kinetic (working). Potential Energy is stored within a system and has not been used yet. Examples of potential energies are the food you eat, chemical bonds, gravitational potential (the energy stored by an object due to its position in a gravity field), nuclear, and spring potential. This means that the energy that existed at the beginning of the universe is still here today. When the universe began, that energy was all in the form of light. Now it is light, nuclear potential, chemical potential, gravitational potential, linear kinetic, rotational kinetic, and heat. Even all of the matter that makes up the universe- stars, planets, nebulae; even your next door neighbor- are all one form of energy. Albert Einstein’s famous equation of E = mc^2 says that matter (mass) is a form of energy (E). describing how the original sunlight was trasformed into light from a lamp. originally came from the sun? Trace the energy transformations back to sunlight.